You’ve probably heard that many Canadians are not financially ready to retire, and many older Canadians are still dealing with high levels of debt (see key findings below from recent studies and links to other articles). I’m sure you’ve also heard that it makes a big difference when you start saving earlier rather than later to avoid having to struggle at a later age. But how many young people do you know who actually make this a priority? How many older people do you know still spend so much on discretionary expenses that they could be putting towards protecting their quality of life at retirement? We all know that anything could happen in a blink of an eye, yet many of us act like it can only happen to other people. But as I was recently reminded, it can take only a few seconds to get an injury or illness that could devastate our quality of life*. Are you one of those people who actually review your financial/retirement plan every year or do you put it off year after year like many people? If you’re not sure where you stand and you’d like to play around with the numbers yourself, here are links to some retirement fund calculators you can use. Just make sure you do a separate calculation for expenses related to major illness or long term care (which is usually left out of most software calculations). These retirement savings calculators should give you an idea of where you stand using an average amount for living expenses, HOWEVER, keep in mind that retirement income needs WILL vary through different stages (e.g. the beginning, middle and later stages). 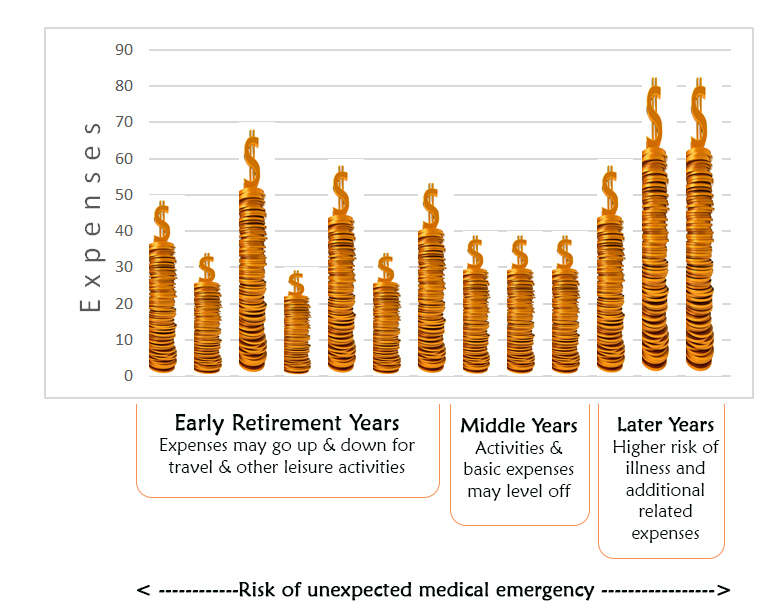 For example, when you first retire you may be more active and travelling, during the “middle years” your activities and expenses may level out, then later the risk of illness increases as we age which may result in higher expenses for medical or long term care expenses (unexpected illness of course can also occur during the other 2 stages). 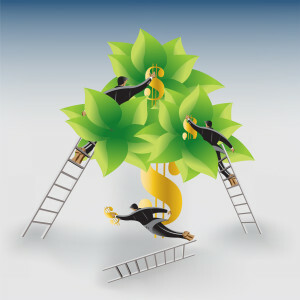 Most retirement plan calculators don’t allow for these different stages, so it’s best to have a customized needs analysis of your specific situation – to meet your specific retirement needs, & your desired lifestyle (see my video on retirement planning http://dytucofinancialservices.com/financial-planning-2/). Assess where you’re really spending your money. Look at your spending history over the last few months or years and be honest with yourself. Then continue monitoring your actual spending against your budget or “intended” spending. Minimize waste & manage your risks. 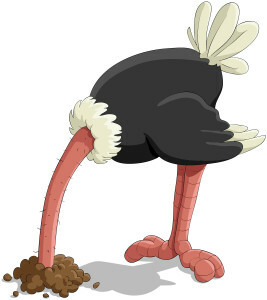 (See my article on some common but sometimes hidden ways we waste money: 10 often overlooked places to look for savings http://dytucofinancialservices.com/blog-grid/); and cover your short-term and long-term risks to avoid having an unexpected event or illness derail your retirement plan (see findings from the OSC study mentioned below). Redirect some of your discretionary spending towards retirement savings. You may have to forgo on some “nice-to-haves” to put more towards your retirement savings and go through some “short-term pain for long-term gain”. Put another way, you may want to spend more of your money investing in building your dream retirement, rather than buying stuff you don’t really need, can put off until later, or indulging in retail therapy. Also look at some strategies that may help make it easier to save (e.g. using auto deposits into an account that’s not too easy to withdraw from) and harder to spend impulsively (e.g. like using cash for your spending money instead of your credit card). SAVING TO BUY YOUR FIRST HOME? Unexpected events that affected finances and retirement plans – such as a need to support adult family members, health issues, stock market decline, or loss of income – impacted 6 out of 10 older Canadians. Among retired persons under age 75, 35% reported that they were forced to retire earlier than they wanted. For two-thirds of this group, health reasons led to early retirement. Of those older Canadians who still intend to retire, 32% do not currently have a plan in place. 60 % of survey respondents have not saved enough for retirement. Over one-third of Canadians say they don’t know when they’ll be able to retire. Over 40 % of employers believe their employees are overly optimistic in their assessment of when they will be able to retire. 60 % of current retirees say their retirement incomes are sufficient to meet their retirement needs, but many project difficulties over time.